The Journey To My Wedding Dress. 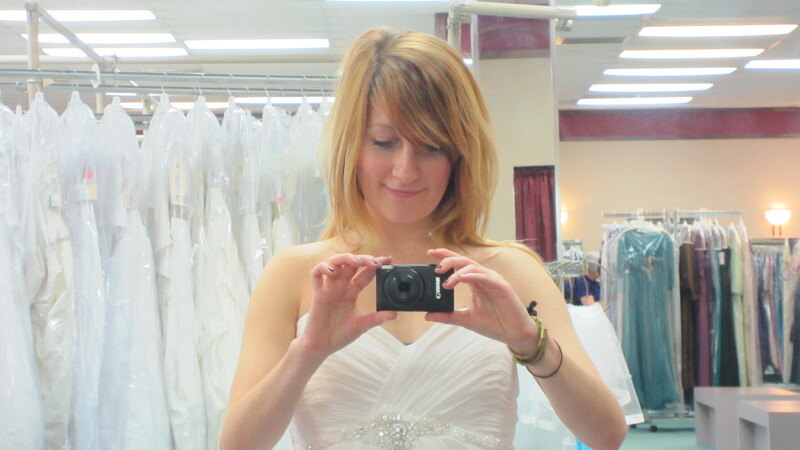 I read in the Spring 2012 issue of The Knot that the average bride tries on three wedding dresses before she finds the one she wants. THREE!? When I read the article, I had been shopping once and tried on six dresses. I had a little five second panic attack. 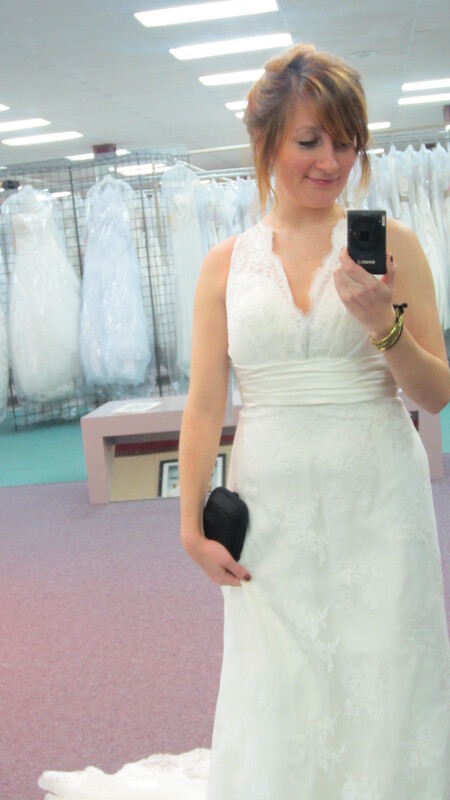 Of the six dresses I had tried on, there were two that were “just okay.” Is that as good as it was going to get for me? Was I destined for a “just okay” dress because I’m short with a “just okay” body? But then I slowed down and gathered myself. I’ve had a talk with my brain about over reacting and getting stressed. There will be emergencies. There will be things that go wrong. There will unexpected happenings. But it’s your WEDDING. You are ahead of schedule, you are prepared, you are excited to get married to the man of your dreams. That’s what you need to remember. So I rolled my eyes and started looking at the article about cakes. I will go ahead and tell you that as of yesterday, my dress has been chosen. Bought. Paid for. On its way. That’s all I’m going to say about it right now because my dress deserves its own post (or seven) so that will happen soon. Wedding dresses are an exciting, almost mythical thing. As someone who never really thought about marriage before Napkin, I hadn’t thought about my dream dress. I meet more and more women who have designed their gown before they’ve designed their husband… but somehow I missed that stage in life. I didn’t really think about dresses until my Mom came to town shortly after my engagement and said we should go try on dresses to get ideas. This was last year, before we had even talked about the actual wedding date… and so it was supposed to be carefree and light hearted. 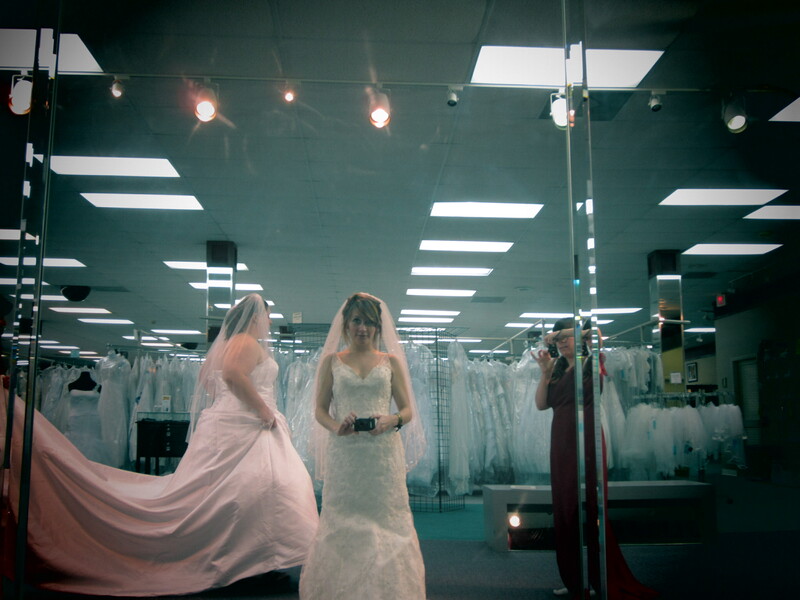 We walked into a Bridal superstore of sorts, packed warehouse style with all the beaded, a-line, ballgown, mermaid, destination dresses you could imagine. Literally thousands of dresses. I started thinking about some of the articles I had read in doctors waiting rooms or half way through pedicures, “ONE DRESS,” “THE MOST IMPORTANT DRESS OF YOUR LIFE, ” “WHEN YOU SEE IT YOU’LL KNOW,” etc. And I started getting nervous. That was the day that I let my mom do a lot of the choosing… and you can see some of her choices here. We didn’t find the one. After that, I put the dress on the back burner. I secretly stayed up a few nights, waiting for my meant-to-be-dress to materialize under the full moon… but it never happened and I decided to prioritize different things. After a few months… I decided it was time to try again. Jammer and I made a date and I picked her up early (well, eleven, which for me is very responsible) and hit the ol’ Bridal Mart. Laugh as hard as you want about Bridal Mart, it was unassuming, easy to navigate around and without aggressive salespeople…which was exactly what I wanted. Maybe it’s because my Mom loved to take us to a huge TJ Maxx on Sundays after church… but I’ll take a store like that over a stuffy boutique any day. Jammer chose a few bridesmaid dresses and I went for the “Informal/Destination” section. Then I had a thought. Try something new. Try an aisle, a dress type, that’s less safe. So that’s what I did. 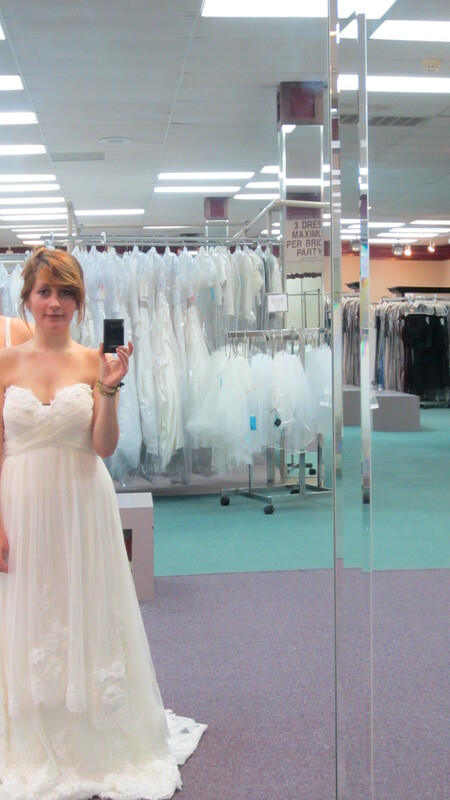 My wedding dress was the very last dress I tried on. There were thirteen before that. They were all over the place, all sizes and makes and 1 through 10 on the formal scale… and naturally, I took pictures of some of them. Take a look! …But then it happened. I tried on my dress and I just knew. Like some sort of unicorn that appears just when you’ve give up hope. Here’s a little sneak peek that I’ll give you for the time being… but expect a proper post soon! 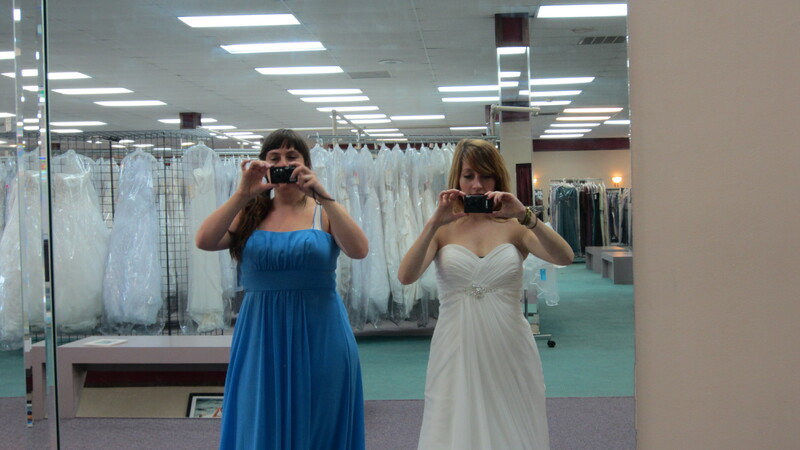 Tags: a line, bridal mart, burlington, destination, how many wedding dresses to try on, lace, wedding dress, wedding planning. Bookmark the permalink.